The complete programme for the Propaganda, Ideology and Animation at, with Theo Ushev as a guest and panels of animation professionals all over Europe. 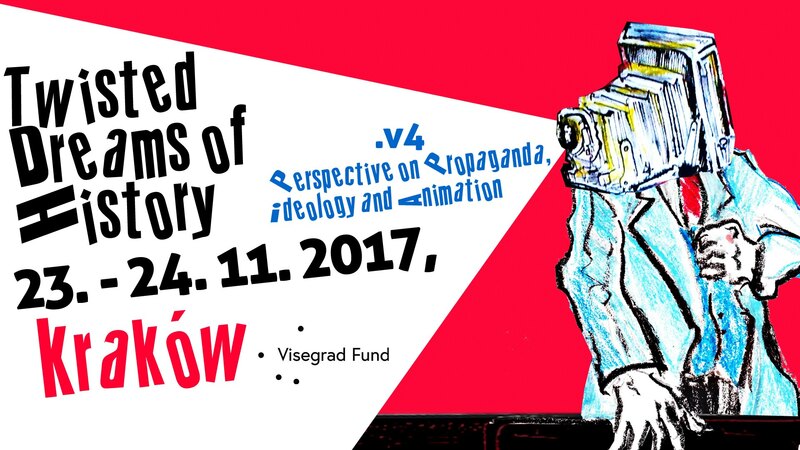 Zagreb School of animation, Chinese animation, Nazi animation, Soviet propaganda but also contemporary feature animation and video games have their place in the 2-day conference Twisted Dreams of History V4: Propaganda, Ideology and Animation, which takes place 23-24 November 2017, at Etiuda and Anima Festival. The problem of interconnection of ideology and animation bears potential for vital discussion about the past and contemporaneity. Analysis of this issue may prove significant for comprehension of media discourse. The cyber-revolution made mass-communication more accessible, egalitarian and interactive but at the same time multitude threats and pathologies have been generated. In the era of ‘fake news’ and ‘post-truth’ participants of audiovisual communication, particularly young ones, are inevitably lost in information overload and phantom ideologies. Youth from V4 countries is a first generation born in a democratic system for whom authoritarian regimes belong to the distant past. It is necessary to take upon the effort of raising their awareness of indoctrination mechanisms typical for both 20th and 21st century media discourses. A continuation of the 2013 Twisted Dreams conference, this one extends its mandate to state and identity politics within a wide range of animation production, both pre-Cold War, during and after European integration. It includes talks and speakers (assembled by conference organizers Olga Bobrowska and Michał Bobrowski) like Brigitta Iványi-Bitter (Hungary, " Hungarian Animation Series from the Cold War Era""), Paola Bristot ("Playing Toy Soldier"), Mikhail Gurevich ("End of History Eastern Style), Michaela Mertová ("Czech Propaganda"), Chenning Guo ("Women through Silent Paper-Cut Animation), Maroš Brojo ("Slovak digital games"), our own Head Editor Vassilis Kroustallis ("Travelling with Crulic"), and Theo Ushev ("A-Z: Animation as a weapon"). Keynote speech: Brigitta Iványi-Bitter PhD (MOME, Budapest, Hungary): "Self-destroying Propaganda. Hungarian Animation Series from the Cold War Era"
"Titoism and the Idea of ‘The Third Road’ as Ideological Foundation of Zagreb School for Animated Film"
">>Not to Worship Is Impossible<<: Notes on Representation of Leadership in Chinese Animation "
Twisted Dreams of History V4: Propaganda, Ideology and Animation Conference takes place 23-24 November 2017, at Etiuda and Anima Festival. Foundation for Promotion of Artistic, Film and Audiovisual Culture "Etiuda and Anima"